PosiCharge™ SVS80 is the cost-effective solution for fast charging high usage Class III vehicles such as pallet-jacks and tuggers. 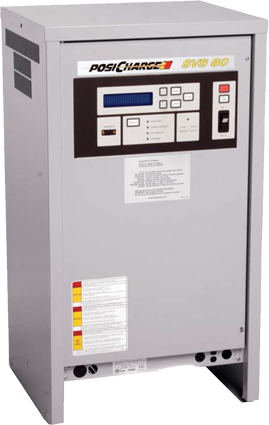 Featuring high-efficiency IGBT power electronics, the versatile SVS80 has a compact footprint for easy integration. SVS80 provides up to 200 amps of current through a single port and is the optimal solution to round out your fast charge fleet. Vehicles recharge at various times throughout shifts during short but opportune “fast-charge” windows - like breaks, lunches, downtime and shift changes. And like all PosiCharge chargers, the SVS80 works with a broad range of battery voltage and has the same data-management and on-board intelligence.